Nine agencies are in the running to win the Public Service category for this year's Campaign Big Awards, for which the final shortlists revealed today. Wieden & Kennedy’s "#EndangeredEmoji" campaign for WWF is among the list of contenders. 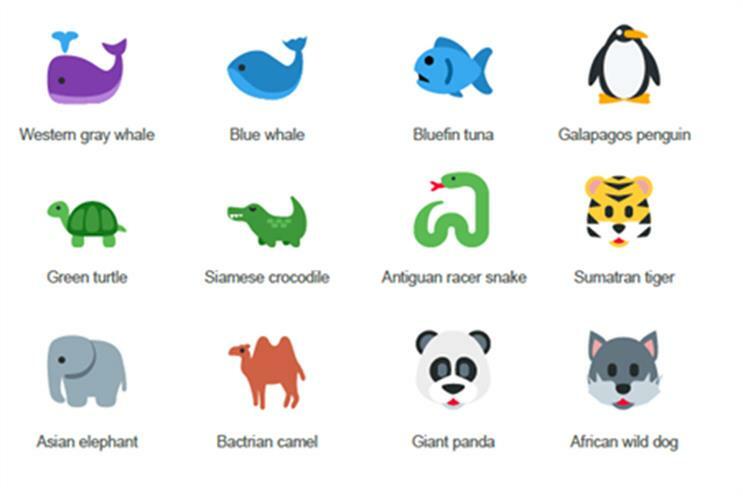 The interactive campaign introduced 17 emoji animals whose real-life counterparts are endangered. Tweeting each emoji would donate £0.10 for conservation. The "50 years campaign" by AMV BBDO for Department for Transport marked half a century since the government department’s first THINK! campaign. Ads and case studies from the last 50 years were presented alongside current research to highlight the dangers of drunk driving. 4Creative’s "E4 Shutdown" for Channel 4 saw the entertainment channel remain off-air from 7am-7pm on the day of the general election to encourage its young viewers to vote. The "every man remembered" campaign by RKCR/Y&R for the Royal British Legion aimed to individually commemorate over one million people who were lost in the First World War. Engine’s "missing type" campaign for NHS Blood and Transport saw the letters A, B and O disappear from prominent brands and locations, including the Downing Street sign. Its aim was to raise awareness of blood donation. Operation X, devised by WCRS for Royal Air Force, saw the launch of an interactive insight into the world of RAF, from a pilot to a chef, highlighting the importance of each role. Leo Burnett’s "share aware" campaign for NSPCC addressed the dangers of children sharing online and advised how to help children stay safe when using social media, games and apps. "This girl can", created by FCB Inferno for Sport England, encouraged more women to engage in sport and exercise, closing the gender gap in sporting involvement. Completing the shortlist is "there’s another side to the story", created by Publicis London, for youth homelessness charity Depaul UK. The powerful outdoor campaign featured passersby being shown signs displaying the two sides to helping, or ignoring, the homeless. The judging for the Campaign Big Awards took place in London last week for five days. The shortlists decided by the judges were revealed the next day on Twitter and on Campaignlive.co.uk.